For our fifth and final project we were assigned three developers from the Web Development Immersive program at GA and one UX-Designer from the User-Experience Program. My documentation is quite extensive so I will not post it all here. However, if you wish to dive deeper into it, you can view the market research document here and the PRD here. After two sprints and 17 days of intensive work we presented firstly for my class, followed by a 5 minute pitch for a panel of Venture Capitalists and a larger audience of GA community. Want to test the website yourself? Give it a go! For our fourth project Ray Lou and I were temporary hired to work for General Assembly and our task at hand was to conduct user research for a new online circuits class in Data Analysis. We started out by mapping out students to target based on a preliminary survey our clients had conducted. We identified prospective students and reached out to them with a small incentive, hoping that they would give us an interview in return. We interviewed 10 people by phone for about 30 minutes each. After transcribing the interviews we analyzed the responses and broke them down into segments. As patterns started to emerge, we identified 4 personas. We created empathy maps for the personas and based on our initial assessments and research, provided recommendations as to how our clients should proceed with further research and course planning. You can view our presentations below as well as read our high level recommendations below. Data Visualization is the most important to learn (among all industries). Curriculum should be applicable today - business relevant, not purely theoretical. Not reading books, interactive way of learning. Subjects seem to have a thorough understanding that they are not using data analysis to its full potential. They feel like they are missing out on valuable insights that could make them better at their jobs. Subjects want GA to educate them on which tools they should be using and how. Important concepts and tools to cover: Google Analytics, Excel (basic and advanced), SQL, Data Visualization tools. From our research we found that prospective students currently deal with data in some form on a weekly basis and want to become better at it so that they can improve on their job. The majority of subjects are over 30 years and well established in their careers. Success from the program is measured by being able to quickly apply the skills directly to their current work, so it is important that the curriculum consists of real-world problems, with a focus on user-based technology products. As they engage in the learning process they want to see incremental progress to stay onboarded. It is important that the program has crystal clear milestones and steps of completion throughout the duration of the course. Interactivity is important, and being able to conduct most of the work directly on the web without needing to download additional software (like dash). Video tutorials should be super simple. One way to gauge skill level is to require an assessment test before enrollment. Based on their proficiency in the proposed topics, students can receive varying levels of pre-work and/or choose to move past beginner modules of the class if they already know the topic. Develop two or more levels per module (Basic/Advanced). Students will take an assessment test before each new module and only get access to the module that fits their knowledge and skill level. This way some people get advanced tutorials while others get more basic. Build a wide variety of modules around content. Request users to answer questions upon enrollment to understand what their needs are and what tools are most important for them that they learn. After assessing, offer ten modules relevant to their personal learning objectives and needs, and hide the others. This allows for a broader reach immediately and a more narrow scope in terms of finding right mentors. Continuous motivation and feedback is important. The mentor will help with both feedback and questions. Users reported that releasing all the modules and curriculum at once will be overwhelming and demotivating. Some find the topic intimidating and want to move slow. General consensus that they are exposed to piecemeal understanding of data as a whole. Google Analytics is sought after. If not intended for the program, this should be marketed very clearly. Most subjects have taught themselves Google Analytics through video tutorials and Google search. It may be beneficial to incorporate certain functions like optimizing different methods to visualize data within Google Analytics. Data visualization should be the prime focus. A majority of the subjects create presentations frequently and want to better communicate data to their less technical stakeholders through visualization. The goal is to be better storytellers and convey the message across effectively. Due to the online nature of the course, users want to learn on their own time and with a reasonable weekly time commitment. There should be a way to access both peers and mentors for quick feedback (something akin a forum). Are the 10 subjects interviewed representative? Many subjects seem keen on increasing proficiency in Google Analytics. Figure out whether this is representative of all previously surveyed subjects. If so, find out if they are still interested in taking the course if it does not include Google Analytics. Make sure it is clearly communicated that Google Analytics is not part of the course. Nail down breadth and depth in terms of course development. Create separate landing pages and A/B test which tools are more popular with your potential applicants. Send out different emails marketing the course two separate ways. Advertise certain tools in one email and a different set of tools in another ( basic tools such as excel and sql be standards) and measure which tools get the highest turnout. Initial assumptions was that recent graduates would be interested in this course. However, our respondents did not fit this demographic. It is hard to tell whether this age group just is less likely to respond to requests for interviews or whether the target audience is older than anticipated. In terms of re-surveying or additional user research this subset of younger users is worth figuring out (as they obviously are an attractive demographic to have). For project 2 we were tasked to come up with a new product feature for an existing company. I was tasked with the Seamless Challenge. After multiple hours of brainstorming I finally landed on the new product feature "Food Surf". You can view the presentation on the bottom, but the following documentation is how I envisioned the product would evolve from idea to launch. Project Food Surf is a new meal discovery feature integrated into the Seamless mobile application. The core feature is swipeable images of food ready to be delivered. Food Surf will allow users to swipe through pictures of various dishes posted by restaurants on Seamless. Project Food Surf is launched to increase users restaurant delivery choices.Through visual cues, the users will feel encouraged to order food from undiscovered restaurants. The feature will be a valuable addition to the Seamless user-experience as well as drive more in app-engagement. The overall goal of the product is to drive profit with increased frequency of purchases, customer acquisition and new restaurant partnerships. P0: As a time-pressured and lazy millennial I want to flip through visuals of what I am ordering because I don’t bother to read through all the food-descriptions. P0: As a college-student who loves food I want a fun way to discover new food options because I often feel bored and like to browse seamless during class. P0: As a fitness-blogger I want filters so I have control of exactly what I am ordering because I don’t want to order anything unhealthy. P0: As an adventurous eater who loves to try new things I want to discover new restaurant dishes and easily add them to a favorite list so I can revisit them the next time and keep track of what I have tried. P0: As an indecisive foodie I want a one-click order now option to make the decision making process easier - if not it takes me forever to choose. P1: As a hungover college-student I want to flip through high quality and delicious pictures of food because I feel sick and need to stimulate my appetite with visuals. P1: As a foreigner with poor-english skills I want to view what I am ordering because I can’t read the descriptions. P2: As a working mom I want to filter what I am looking at because I don’t want to flip through food-pictures that I know my children will not like. P2: As a bored professional I need to find something truly mouth-watering for lunch because I need something to look forward to at work. P2: As a professional athlete I want a way to order super quickly because I need to eat all the time and don’t have time to make food myself. . Upon logging into the seamless application, our test A beta-users will be met with a pop-up notification prompting them to try the new “Food Surfing” feature. If the user clicks “YES”, the user will be taken to an interface in which an image of a tempting food is displayed. The first time users interact with this screen they will be given a 3-step description process of how to use the feature, including the swiping gestures, favorites list and “instant order” function”. After clicking “Got it” they will be able to interact with the feature as intended. Users will have the ability to swipe to the right. If the user swipes right, the meal will automatically be added into a favorites list. This feature will also be enabled by tapping a “yes-equivalent” icon. User will have the ability to swipe left. If the user swipes left, the image will disappear and a new image will show up. This feature will also be enabled by clicking a “no” icon. User will have the ability to click an “i” icon in order to access more information about the food-item and view other menu items from the the same restaurant. Users will have the ability to filter the images they are shown based on price, delivery time and ratings. Users will have the opportunity to view images filtered by cuisine through a separate tab. The user can click a large one-click “order now” button and the food will be delivered directly to the user within the estimated delivery time. User will have the ability to click a tab icon representing favorites. Upon clicking the tab, users will be taken to their favorites list. Users can click on a ‘back’ and a ‘shopping cart icon’. The shopping cart icon will take them to their shopping cart. Upon entering the favorites list, users can tap a favourite meal. Upon clicking which meal they want they will automatically order that dish and be thanked for their order. Users will be prompted to leave feedback on the new feature by answering one simple question with three check-box options. Upon answering the question they will land on a “thank you for ordering page” and have the opportunity to navigate back to the original UI. When re-entering the original seamless user-face subsequent times, a small, but noticeable “Food Surf” widget displayed on top of the UI will take the user back to the Food Surf feature. Note! The following information is based on the Seamless Website (due to limited data insights to the mobile application). We believe that this audience is a statistically valid representation of our mobile audience. There is also research proving that this feature will appeal to our male users. A scientific study of young, healthy men examined the specific physiological reaction of the test subjects to images showing either delicious food or non-edible objects. The concentrations of different hormones in the blood such as grehlin, leptin and insulin, which play a role in the regulation of food consumption, were measured. The researchers observed that the concentration of grehlin in the blood increases specifically in response to visual stimulation with food images. This study demonstrated that the release of ghrelin into the blood for the regulation of food consumption is also controlled by external factors. Human brains process these visual stimuli, and the physical processes that control our perception of appetite are triggered involuntarily. Furthermore, a study conducted by the Society for the Study of Ingestive Behavior suggests that this specific hormone, ghrelin, increases peoples willingness to pay for food, while simultaneously decreasing their willingness to pay for non-food items. Based on GrubHub Seamless financial reporting data from Q1 2014, there is reason to believe that we have a massive and untapped market opportunity. The US has over 350 000 independent restaurants, whereof 30 000 currently are Seamless Partners. Americans spend 67 billion on take-out annually, while only 5% of this is online. As mobile adoption continues to grow our products will only become more attractive. Through further product/business development and marketing, Seamless can potentially increase revenues from 1.8 to nearly 8.5-9.5 billion. Internet trends and networks in the food category is also a profitable and attractive market to leverage. Social networks, apps and blogs about food, recipes and restaurants are spreading virally. To provide a mild indication of what the demand looks like we have looked into some popular food-related hashtags on social media. Beta-user launch: 10% of total active users: ca. 5 000 000. Our 500 000 beta- users will be from the New York City’s five boroughs. This is due to the vast number of NYC restaurants delivering through the seamless app. Currently NYC accounts for 7074 of >30 000 total Seamless’ restaurant partners across 800 cities in the US and London. Users who use the Seamless service >3 a week. Gender ratio of beta-users should be equivalent to the gender ratio of our total user base to get accurate results. Open-rate: % beta-users that click yes to the alert upon logging into the seamless app after product-launch. 20% open rate at first login after launch. % of beta-testers that try new feature even though they dismiss initial invite/push notification. 60% over 2 months following launch. Total aggregate of favourited food-images across user profiles. % of favourited foods ordered. Instant order/purchase-rate using the “order now” button. % of users using the “order now” button. Drop-off rate : % of users who try it once and never return to use the feature (churn rate). Satisfaction rate: % of users that report satisfaction on customer feedback request. 50% active users after two month launch. Active users= uses feature twice weekly. % of users that order from restaurants they have not previously ordered from. Our minimum product adoption rate should be over 40% (200 000), with a goal of 50%(250 000) over Q2 and Q3. Our overarching goal is to increase the amount of new restaurants users order from. Our goal is 2 new restaurants per week per active user within first year. By enhancing the seamless experience and increasing engagement and purchase-rate within the Seamless app, more restaurants will profit from our users. As restaurants grow their profits through increased customer acquisition, more restaurants will want to partner with us. As our partnerships continue to expand, more customers will become aware and drawn to our platform and thus continue the upward spiral. Management: Make decision and give OK to project by February 18th. Owner: Director of New York. CFO: Establish final budget and outline financial cost structures by February 23th. Owner: CFO of New York Office. Developers/engineers: Develop MVP by March 25th based on design and prototype from designers. Owner: CTO of New York Office. Design: Sketch design and prototype by March 10th ready for user testing. After usability test, final design delivered to CTO by March 15th. Owner: Head of Design. Product: Conduct User Research by March 5th. Deliver 10 users for user testing by March 9th. Sales: Approach >100 restaurants with a variety of cuisines in New York City and encourage them to participate in initial launch by explaining their gains, offering to take pictures of their plates and submitting them to app. Owner: Head of Sales. Marketing: Ensure quality of photos submitted by restaurants. Send photographers to restaurants to maximize quality of initial feature photos. Develop marketing materials for new feature within 6 weeks, ready by April 14th. Owner: CMO of New York Office. ‣ design: March 10th. Duration from budget sign-off: 15 days. ‣ design signoff: March 15 th. Duration: 5 days. ‣ development: March 25th. Duration: 10 days. ‣ internal testing/QA: March 28th. Duration: 3 days. ‣ launch signoff: April 5th. Duration 7 days. ‣ launch: April 6th. Duration 1 day. Evaluation of Initial Launch: June 5th, 2015. Primary research suggests positivity towards the feature, so it should not be a challenge to get partners onboarded. We will initially approach restaurants with rich photo material of menus. Due to the vast amount of venues in NYC, if some restaurants choose to opt out we have many alternatives (more than 6000). Should images not meet our quality standards we will hire photographers to ensure their quality and/or help venue owners build portfolio. A risk is also that users ignore the invitation or find the feature useless/clutter/unnecessary. If we see lack of engagement or high drop-off rates we will revisit and refurbish the content and basic functionality/UX/UI of our feature. If users reject to try the feature we will incentivize through discounts when ordering food through the new feature the first time they try it. After our MVP roll-out we will consider our KPI’s and evaluate our goals and metrics. If we succeed to meet our calculated KPI’s, we will continue to refine, build and roll-out the product in other big cities, starting with these three after a two month initial launch in NYC. 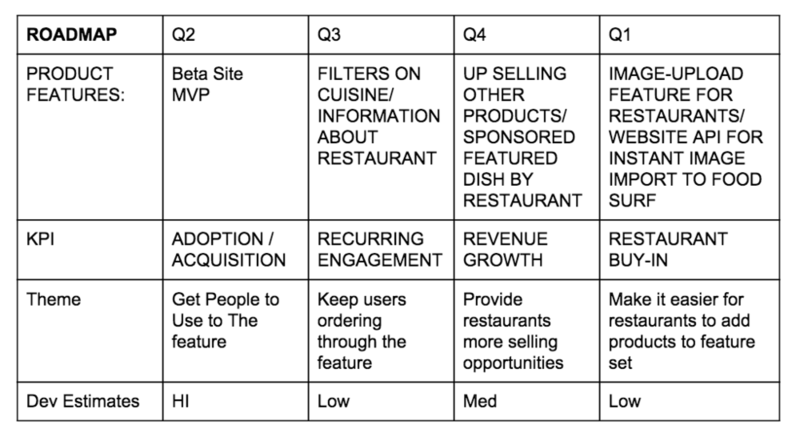 If product still meets KPI’s, we will roll out the feature to our entire user-base when new restaurants partnerships are successfully established, within one year. To help facilitate the inclusion of over 30 000 restaurants that may want to participate we will send out an email where they can request invitations in order to control the sudden demand. We will need to set specific requirements for resolution and quality of images submitted in order to ensure the products continued value. When development requirements are met, restaurants will have the ability to upload images of chosen menu items into the feature themselves. We estimate this to be possible within 1 year of initial launch. Our user research also provided us with some interesting information indicating the value of social recommendation and recognition from users social networks inside the Seamless platform. Our next steps would be to consider the overall value and ease of implementing a social feature within the product that would allow users to view which friends in their social networks have ordered or liked the images that show up in Food Surfs stream. This should be a quick process as Facebook’s API is open and requestable. Inclusion of social profile widgets underneath presented photos to symbolize who has favorited/ordered the food before you. Social Food Sharing - Users can share on social networks when they order food and what they order. The new feature also opens exciting opportunities in terms of new revenue streams coming from sponsored images. A solution would be that restaurants can have the opportunity to pay a premium to have a larger user-base view their images and to have their menu items featured more frequently in the stream. Yelp wants to create a new app or feature within their app that emphasizes ‘flash mob’ group discounts at select restaurants. Where did we go from here? Well, we came up with Yippie, a new social feature for Yelp that would enable dining customers to redeem group discounts if enough people checked in to a restaurant. We did extensive customer research to identify a market need, and based on the research we developed a wireframe and mockup for our initial MVP (minimal viable product). Based on our market research and quantitative analysis of over 135 responses from our consumer survey we have reason to believe that it is worth moving forward with our new product feature. A vast majority of our responses came from people within our target age segment (16-34) and proved that this age group are heavy restaurant goers, with nearly 50% reporting to dine out 2-4 times a week. It also showed that when deciding on a new restaurant, 43% typically resort to apps in order to find a new venue, with over 60% of respondents reporting that they use the Yelp app for restaurant recommendations and/or booking. More than half of our respondents report that they have checked into a restaurant using an application in the past, and nearly 70% reported that they would be willing to check into a restaurant if it gave them a discount. Our qualitative research further validated our assumptions. People typically use apps to find new restaurants, and the majority used Yelp as their go-to application. They also reported that they were intrigued by discount sites and would use them sparingly, and not surprisingly the deciding factor not to use them was the awkward gesture of having to present a coupon to a server who might not be informed of the deal. From speaking to multiple outside resources in the discount-app industry at various meetup events we started to recognize a trend. Coupons are becoming less popular because the behavior associated with it has a negative connotation. The process is not seamless and seems too much of a hassle. The “Uber of everything” is the new standard, and if discount features aren’t incorporated seamlessly they are far less likely to be used. There is therefore reason to believe that our feature would be valuable to both consumer and business. On the consumer side because it would allow them to enjoy the discounts without having to pre-purchase a coupon and awkwardly present it to their server. They would be able to check in through the YELP application, and given that enough people dining at the restaurant do the same, they would be prompted to present a code to the server who would apply the discount directly to their bill which they would be given the opportunity to pay for through the app or using a traditional payment method. Businesses would enjoy earned social media attention and recognition on their Yelp page and thus attract more diners to their venue. Now that businesses have access to their Yelp page to better manage customer relations and inquiries, restaurant owners have more control and value because they understand their customer base and can communicate directly with them to get feedback. The added value of gaining a deeper understanding of their customers profile is valuable for marketing. Because the discount diners are already interacting with the Yelp app in terms of checking in at the restaurant they will also be more likely to leave a review, which due to the discount will hopefully be positive. As a result the restaurant will be able to build it’s Yelp reputation and gain social validation which will pay off in the future. Our market research also indicates that there is curiosity and intrigue about this new feature. Even people who reported to never check in at restaurants said they would do so if they received a discount. Research also shows that they are likely to dine out more often if they receive discounts at the venue. There are other popular competitors such as FourSquare who have similar features that have proved popular within our target audience. All though their market share is significantly smaller, Foursquare provides personalized venue recommendations based on prior behavior and friends preferences, constantly pushing suggestions to users phones if they target their location close by. Yelp is a highly recognized brand and had an average of approximately 139 million monthly unique visitors in Q3 of 2014, with over 67 million local views. In comparison, Foursquare has 30 million users. Our target audience also aligns with Yelp’s current user base. Nearly 40% of our users are within the target age group that this product would be marketed to. The new feature, Yippie, will be launched in Beta in New York City. This is due to the fact that out of all US cities it has the highest number of millennial citizens which is our initial target audience. The city is also known to have a vibrant dining culture and due to it’s citizens busy and tech-savvy lifestyles they find and choose restaurants using apps “on-the-go”. According to Yelp’s statistics, the millennial audience makes up the largest demographic of the app. Based on our Survey results 60% are interested in deals. This accounts for 31.86 million potential users. Recent statistics report that 64% of Millennials across the US eat out more than once a week. There are currently no other significant competitors that offer an identical product. There are multiple coupon sites and apps on the market, but none that offer the real-time group-sale feature for restaurants. Get anywhere from 50-90% off the daily deal in cities across the United States. Find a deal each day with a value of up to 90% off. Social buying website with discounted deals from local merchants. HomeRun features deals to various locations at 50% or higher. CrowdSavings: get deals on local purchases. Deals range from 50-90% savings. This is because they offer similar features and have a strong audience. Users tend to shift between these products even though they have similar functionality. All though some of these services offer savings and discounts, none currently offer a real-time flash-mob sale for “on-the-go” consumers. I recently enrolled in Product Management Immersive at General Assembly. The 10-week intensive program explores the pathway and execution methods from idea to product, following the best practices and methodologies. During our first week we were encouraged to come up with a startup idea, typically a website or an app (technology service). Our main focus was to use our newly acquired skills of agile, customer discovery, user research, wireframing, prototyping and MVPs. NewsFlix is a news app with an all-in-one payment solution that enables access to recognized news sites premium subscription content. The app eliminates the issue of managing multiple premium news subscription accounts and streamlines people's daily news consumption and payment process by adding multiple sources to one application. 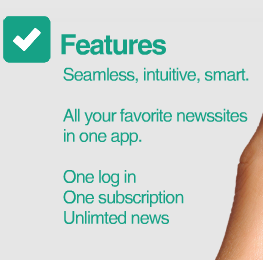 It also makes your daily news personal and beautifully accessible in one app. Articles will be pulled into the app and sorted on topics, news sources or stories based on user preferences. People read a lot of news and are faced with a daily information overload. They access news mostly via social media, push notifications from downloaded apps and by accessing favorite news sites. Most of the world’s high quality and reliable news sites offer only a selection of articles per month to read unless users pay for a premium subscription. If users choose to subscribe to multiple sites, they have to manage multiple accounts, passwords and payments. In order to consume the content from the sites they subscribe to they must visit the respected sources sites individually or access their sources branded apps on their phone. Users pay for their news by viewing online advertisements. 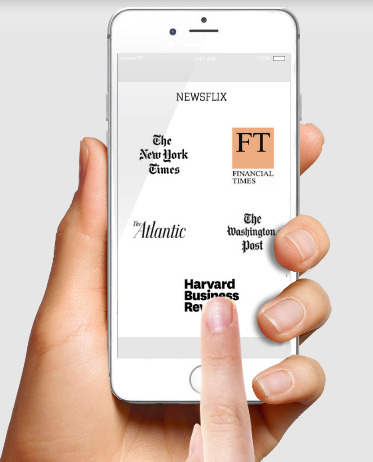 As more and more news sites resort to digital advertising business models, the user experience is deluded and intruded by excessive banner, pop-up and sidebar ads. In some cases it can be hard to distinguish between advertising and editorial content. My assumption is that people find advertising enough of a hassle that they will pay to remove it. As the founder I am biased because I have a background in journalism and I consume a lot of news on a daily basis. I also subscribe to multiple news sites premium subscriptions and find managing them a hassle. I may be projecting my problem on to other people. I also get my news in apps and consume most of my news via phone. Statistics show that we are adapting entirely to mobile and want the most amount of convenience. I personally know multiple high income and highly educated people who would want an application like this. However, this market may be smaller than expected and may prove not to be financially viable. News outlets globally are suffering as their dated business models of print isn’t paying off anymore.Journalists are losing jobs and as a result there are less resources available to invest in investigative journalism and high-quality feature articles. Journalists are losing jobs and as a result there are less resources available to invest in investigative journalism and high quality feature articles. Most news sites are operating under the freemium model. 20% of the users (the premium subscribers) pay for 80% of the freeloaders. They are experimenting with new business models in order to attract more revenue and profit long-term. They find it challenging to find users that are willing to pay for premium content. NewsFlix would be a viable solution as they would get a small cut of the aggregated payment. All though the amount would not be as much as if they were individual subscribers it will ultimately add more profit to the organization as well as attract new and “right” readers. Highly educated, high- income individuals between 25-40 years. Data proves that higher education and income levels are correlated with higher news readership. Will initially include: The Atlantic, The Harvard Business Review, The New York Times, The Financial Times, The Washington Post, The Wall Street Journal. These are among the most credible news sources in the US and have loyal readerships and a significant amount of subscribers. Going forward the app will also allow for people to log in through a NewsFlix API on the external participating news sites also giving them full access to their content. As more readers subscribe, it is suspected that other News Sites will wish to participate as well to get a piece of the pie. Interviewing target audience at UN Headquarters in New York. The majority of subjects were heavy news consumers, and would access the news mostly from apps on their phones. The news sources they preferred were varied, but most mentioned the NY Times because of the high-quality content. Surprisingly they did not seem to mind advertising. However, paywalls was a pain point. Price is the issue holding back the lower income subjects from choosing to subscribe. The higher income subjects typically has one premium subscription, but found the registration and payment process frustrating and did not want to have multiple subscriptions. However, this may be counterproductive for the news sites that already have these subscribers and who would not make that much more money by lowering their price and losing their existing full-price paying subscribers to the other model. Therefore, plan B could be to build an app in which premium news subscribers could manage all their premium content in one app, and also provide their credit card information in order to purchase other news site subscriptions with one click from within the app. This would be an application that would appeal to a niche high-end market, but not attract the big bulks of users. However, it is worth noting that Netflix and Spotify have massively succeeded with similar models among the public and that people generally tend to bend for convenience and ease of use.